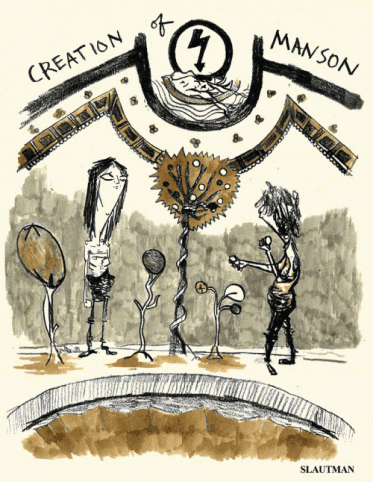 Creation of Manson, The We Be Jammin' Tee and Grape-Nuts, by Sara Lautman (Ray Ray Books). Lautman's scribble comics can go from quotidian to grotesque on a moment's notice, often creating a jarring, unsettling reading experience. Grape-Nuts, for instance, follows three women cleaning out a garage, until a man comes out and makes mention of them eating cereal. As the trio mock him, he piles up lawn chairs and frames, sets them on fire, and walks right into them and then back out, horrifically burned. It felt like he was going to extreme lengths to prove a point or make an impact, and that final blocky, bulky figure is rendered with a great deal of detail that's unusual for Lautman. The We Be Jammin' Tee is a reflection of Lautman's absurd sense of humor, as a ratty t-shirt is rescued and given life by the T-Shirt Magic Fairy, becoming a headless and limbless torso. It's simultaneously sweet and deeply weird. Creation of Manson is along the lines of the prior comic, as it imagines Marilyn Manson's origin story in all its viscerally obscene and hilarious detail. The way Lautman varied her approach with regard to line thickness and overall rendering contributed to the story's mythological qualities. Lautman's sensibilities and approach are unlike virtually any cartoonist working today, with the possible exception of Josh Bayer--and even then, their styles seem like distant cousins. 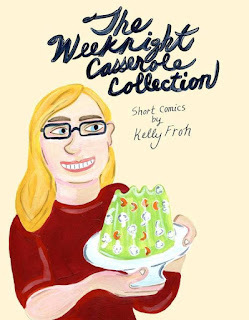 The Weeknight Casserole Collection, by Kelly Froh. This is a collection of work done for a wide variety of anthologies, and Froh points out in an introduction that while anthologies are often uneven, they've provided her with structure and deadlines that have helped keep her productive. 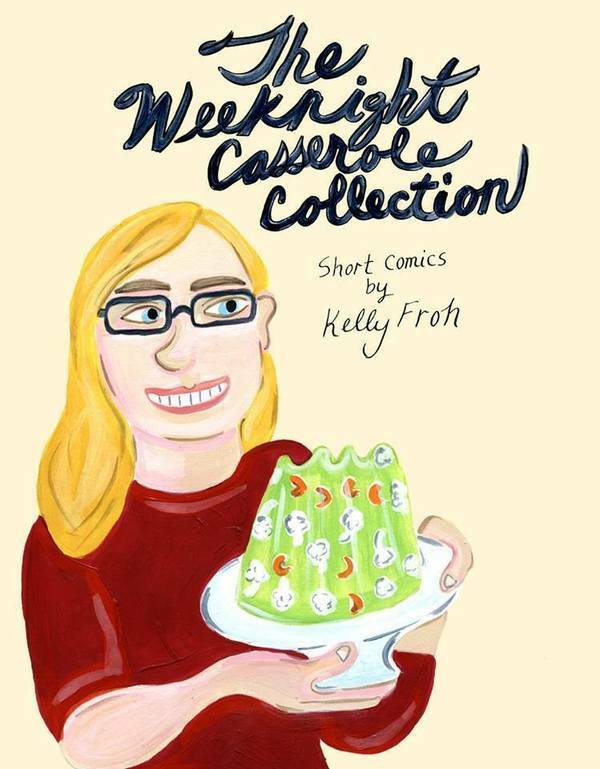 Froh's comics have always had a mix of the sweet and the slightly grotesque, both in terms of her drawing style and the subjects she covers. Her comics about her childhood often feature her in unflattering eyeglasses and hairstyles, and she plays those up for laughs, to be sure. At the same time, her stories about people often acting cruel have a remarkable amount of sympathy for all parties involved; the people in her stories are all human, and she has an acute understanding that everyone is capable of kindness and cruelty. "The Wrong Eric" is a good example of this, as it features Froh's disappointment that a boy she liked wasn't interested in her, but she showed a similar disinterest in a different boy further down the social food chain--which perhaps indirectly led to future bad behavior on his part. Froh is also great at drawing humor out of social awkwardness, like when she didn't realize a friend of hers was in a band that she was waiting to see, or the incredibly strange situation of her boyfriend's best friend possibly hitting on him in front of her. Froh also has a knack for writing open-ended stories that have disturbing components, like "The Rake", which is about the night terrors she has had since she was a child that involve feeling like someone is looking at her as she's asleep, someone dark and shadowy. The warm and inviting nature of Froh's narrative style and line results in a reading experience where one can see multiple sides of a story and where even unsettling experiences are depicted in a manner that's somehow less threatening--as though they were all ingredients in the same dish. 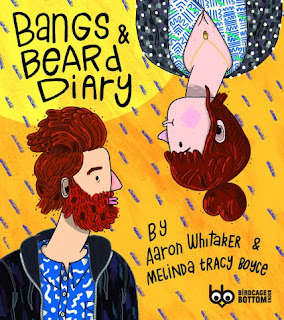 Bangs and Beard Diary, by Melinda Tracy Boyce and Aaron Whitaker. This is a sweet, clever idea: a flip-book comics diary, with a couple each doing their own separate diary of the same days. Boyce, the "Bangs" part of the couple, uses an open page format with no lines around her panels. While there is a clear differentiation between panels thanks to shading, it's her use of negative space that's key to making these comics works. When depicting time passing and panel-to-panel transitions that reflect that, she uses a lot of negative space. When each image is more discrete, there's a harder delineation between panels, with decorative markings or simple grey-scaling doing the job. 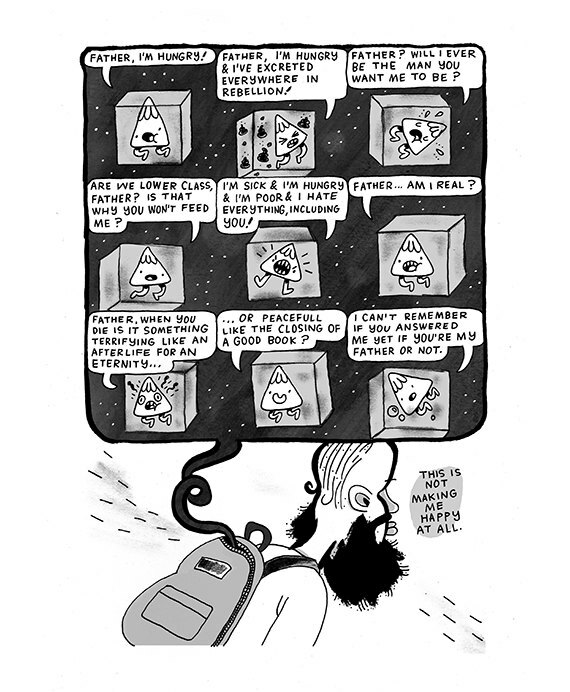 Her drawing and writing style remains similar to that of Vanessa Davis, only Boyce employs a more cartoony style. Boyce shares the same overall cheeriness but is also willing to delve into troublesome emotions and situations, like her strips about body image. Whitaker's comics are denser and use a more traditional grid set-up. In part because some of the strips were done during shows where only Boyce was participating, Whitaker's strips are a bit more introspective, as he expounds on a variety of observations. The two cross over twice: once on a meaningful walk in Los Angeles and once in a tender moment spent alone at the end of a trip. The resulting collaboration of sorts paints a picture of two artists confident in their own skins who greatly benefit from the presence of the other. Globes, by Aaron Whitaker. This comic is a sort of a second cousin to The Little Prince, as the story's protagonist starts the story atop a globe, in search of meaning and happiness in his life. The story diverges from Saint-Exupery in that the hero has his 3D printer create a son for him, one full of questions that the protagonist is not ready to answer. The story spins further as his son grows up, moves out (full of teenage energy and certainty) and then visits again with his own family. The tone of the comic ranges from absurd and cynical to sweet and heartbreaking, sometimes all in the same page. Whitaker nonetheless manages to convey a real sense of what it's like to chase meaning and how one's mistakes as a parent carry over to a child begging for guidance. 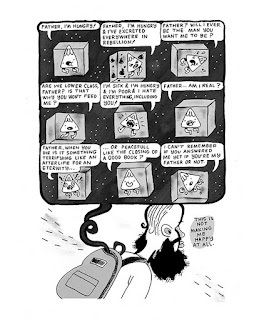 Whitaker heightens these conflicts, of course, and his cartoony character designs (not unlike Adventure Time creations) allow him to keep the stakes high while still keeping the overall mood of the comic light. What I liked best about this comic was Whitaker's willingness to strategically clutter every page with all sorts of detritus, charts, maps, etc. 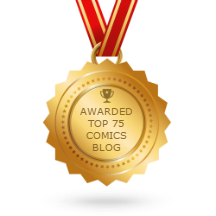 The way he pokes fun at his stand-in's quest for meaning and his overall pompousness doesn't detract from the emotional content of the comic, which is an impressive trick for Whitaker.